This is one of the best couples resort in the Caribbean island of St. Lucia situated in the interesting destination of Soufrière. 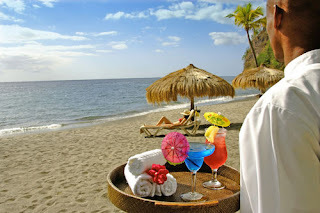 Anse Chastanet Resort location makes it an ideal place for romantic couples to enjoy an amazing Eco-tourism ambiance. You will be fascinated by the tropical atmosphere you will have to relax in with your loved one. The resort provides excellent scenic tropical views of nature in a secluded small hotel setting. From your room you will be able to have breathe taking views of the Caribbean Sea and the amazing Piton mountains. You must be warned that you will have no direct access to most of the modern communication devices while you are at this incredible Caribbean romantic vacation spot. This couples resort has won many accolades in recent years for the excellent vacation experiences it has provided for its guest. As the name suggests "The House" it is an amazing Barbados couples resort located in the fantastic destination of St. James. This resort provides you with an excellent personal touch when you want a place in the Caribbean to be pampered. You just have to relax and use the amazing services provided for you at all time. This is a place that you will get that royal romantic treatment you always wanted. The House Barbados is located in an excellent tropical setting that will ensure you have quality time in seclusion with your loved one. In addition, this Barbados resort is located close to some of the major attractions on the island. There are excellent golf, water sports activities and the famous Harrison’s Cave closeby that you will really enjoy on the island. 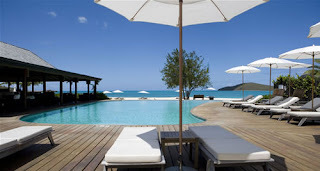 This resort "Hermitage Bay" is one of the top Antigua all inclusive couples resort you will find. It is one of the spots you will really want to choose when you are thinking of secluded Caribbean vacation couples resort. There are some fascinating cottages overlooking the Caribbean Sea that you can choose at the location. In fact, the Hermitage Bay Antigua resort offer three unique dimensions to its cottages to you will love. The design of these cottages will create that excellent romantic atmosphere for couples to create some excellent memories on the island. Interestingly, the resort will serve you some delicious tropical fruits that will delight your taste buds. One of the incredible benefits of the various cottages include providing you with fantastic secluded plunging pools that are private and are amazing spots to relax as a couple. The island of Jamaica has many amazing affordable all inclusive couples resort all throughout its top vacation destinations. The Round Hill Jamaica Resort is one of the many excellent romantic couples vacation resorts on the island. It is located in the destination of Montego Bay and has the reputation of providing an excellent atmosphere for the celebrity visitors. The resort is located in an excellent tropical Caribbean spot for you to sample all the amazing aspects of what a quality Jamaica adult only vacation spot is all about. It is an ideal spot for couples to enjoy some Jamaica and Caribbean entertainment in seclusion. This Caribbean couples vacation resort is located in the popular sailing destination of the British Virgin Island. Peter Island Resort is one of the many secluded private islands you will find in this territory. It is a place you will want to visit because of the incredible opportunities for seclusion and luxury. This is a location you will find more staff than visitors so you can rest assure that you will surely be pampered at this resort. You will find excellent luxury suites and villas to choose from. In addition, you must be prepared to enjoy water sports and some exciting sailing adventures on your couples Caribbean vacation.